It’s time to get the kids geared up for the new school year! It's back to school soon... is your kid ready to take on the new school year? 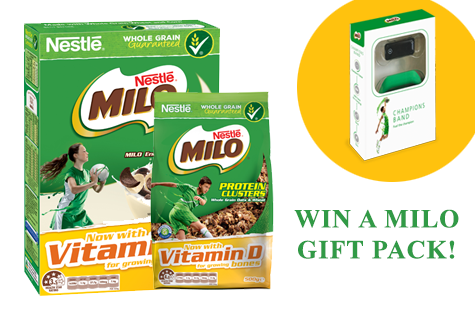 Committed to fuelling kids for the day ahead, the team at Milo Cereal has now included vitamin D amongst the range, so kids can get more out of their breakfast with every mouthful! Why vitamin D? It’s essential for kid’s normal growth and development and can help calcium be absorbed, helping to build strong bones in growing kids. Interestingly, research shows that the majority of boys and girls ages 14-18 years aren’t getting enough calcium and vitamin D plays an important role in how effective calcium is. Whats more, a single 30g serve of Milo Cereal now provides 25% of the Recommended Dietary Intake (RDI) of vitamin D.
And because MILO wants to encourage kids to be healthy, they introduced the Milo Champ Band. The MILO Champions band activity tracker and Champ Squad program is a digital platform and fitness & activity tracker that uses the latest wearable technology and smartphone app to encourage youngsters aged 6-12 years-old to get active through sport (also a digital watch). Within the MILO Champions band app, kids can join the ‘MILO Champ Squad’ where they can learn new sporting skills from some top athletes, including Holly Ferling and David Warner, through an augmented reality experience. This summer, David and Holly have put together a fun program that will get kids to put their new skills into practice, with exciting activity challenges where kids can be encouraged to keep active by earning points and rewards. Kids can also team up with their friends and follow fun skills and challenges to do together, making being active and engaging in sports fun and more rewarding than ever! From batting and bowling through to throwing and catching, the MILO Champ Squad gives kids the chance to develop physical fitness, social skills, sportsmanship and get a better understanding of Australia’s favourite sport. The total RRP of each gift pack comes to $57.96. Grand Theft Auto: San Andreas is significant diversion with an astounding measure of detail for its size. Download Zombie Tsunami 3.7.0. Lead a relentless influx of zombies. The perfect addition to every summer dish!